BENGALURU: You are walking on a road below a flyover in Bengaluru and to your surprise you don’t see drunkards or mounds of construction dirt in the empty space under it. Instead, you see a stage where a number of children are staging dance recitals and people cheering for them. No, this is not some made up scenario but actual scenes from a community programme that was organized under the Benniganahalli Flyover in Kasturinagar, last week. This program was a culmination of an effort that had taken over a year to execute by the local residents under a group of vigilant citizens called the the Kasturinagar Rising. Residents tried to get the matter solved by complaining to the BBMP but as is the case with such efforts, it went in vain. “The flyover falls in mid area between ward number 51 and 50 (Benniganahalli) and we went to the the concerned BBMO engineers they would shift responsibility claiming that it’s the other person’s job,” he adds. The residents took it upon themselves and so work started on January 2016. It began with JCB’s clearing small portions of the space until most of the mounds were cleared and the space fenced by the end of the year. A total of 120 people from the locality donated a total `4 lakh for various expenses including a local eatery that gave `10,000. While majority of the space is now cleaned a small portion is still in a bad state and will be cleared soon. 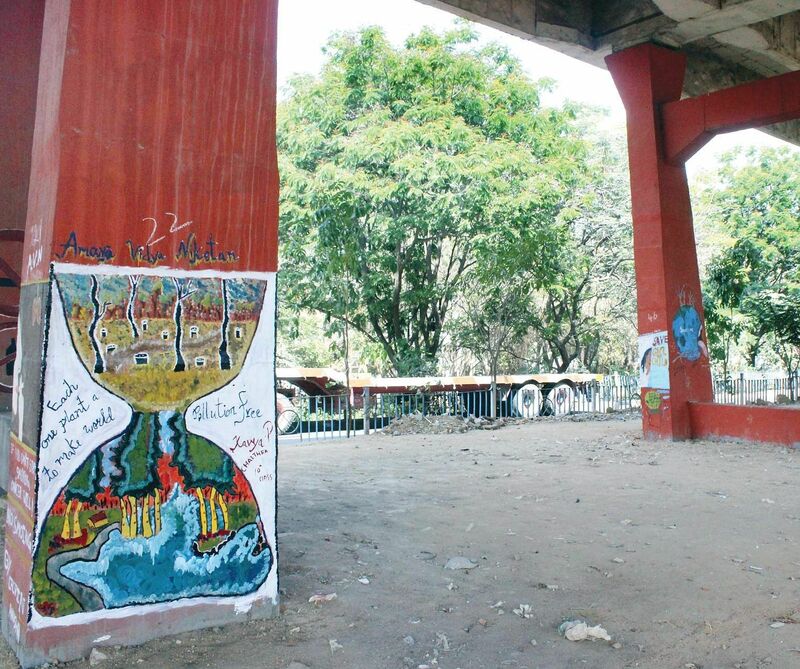 The pillars are marked by paintings and art work instead of urine and paan stains thanks some local school children who decided to spend an afternoon here. Another idea is developing the place into skating rink. “We have plans but do not know the legality of using such a space as yet and do not want to do anything illegal,” cautions Ravi. Since their first major success, they have done a number of other spot fixes with another major spot fix being of a park in the area that was again frequently used for various anti-social activities.